El Sendero is an established community on the North West side of San Antonio that is experiencing exciting development in both residential and business growth. This beautiful community is definitely a place where families are rooting themselves in the heart of highways 151 and 410 expansion. The Northside Independent School District includes wonderful elementary, middle and high schools. Choices of family medicine along with emergency medical services are all nearby. 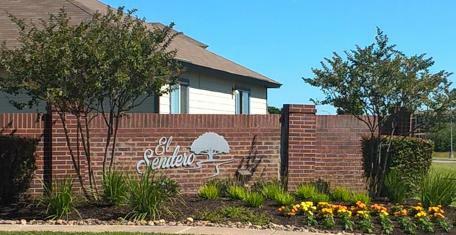 Families of El Sendero are within twelve minutes from Sea World of Texas and only fifteen minutes from the retail and entertainment expansion in The Alamo Ranch business district at highways 151 and 1604. And for weekend excursions, destinations such as: Paradise Canyon, Fiesta Texas Six Flags, The Pearl District, children’s museums or the Riverwalk are only thirty minutes away from homeowner’s driveways. The five volunteers serving as Officers for El Sendero HOA, are passionate about preserving their community’s value in its original form. Every HOA meeting is a labor of pride and efficiency reinforcing valuable guidelines and keeping communication open with homeowners. The Social Committee coordinates one of the largest attended National Night’s out, on record. The Board of Directors work tirelessly all year procuring swag, entertainment, vendors, catering and special guests that ultimately provides something for everyone. El Sendero is currently in the middle of a huge project managed by the Board of Directors and their management team. Homeowners will soon be greeted with enhancement upgrades to the front entrance fencing, landscaping, lighting and entry signage. We are excited to be partnered and assisting with the Board’s vision and cannot wait to experience the fresh new look with their community.